I love a man that wears a chain on their wallet. There’s just something about it that makes them cool. 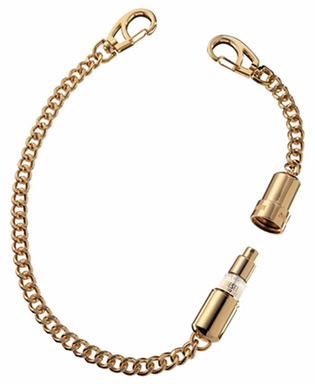 So how about this DIESEL Fuel For Life Pocket Chain ($75 @ macys.com)? What if I saw a man carrying this 18" chain on their beltloops? I think if you have a fashion forward boy in your life then he will appreciate this one. And it's not just for men as they make one for women too. Both are “inspired by the passion, emotion and sensuality that flows through each of our veins” and we really liked it when it came out. Give something totally unique this season. Imagination, memories, fantasy – fragrances can conjure up a vast array of emotions. 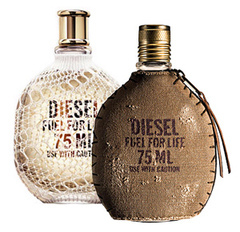 Tap into your edgy feminine side with DIESEL’s new ‘Fuel for Life’ Femme Spray ($49.50/1.7oz). Notes include florals, jasmine, black pepper, fresh black currant and a base of musk. And the crocheted lace case around the bottle is a really nice touch. Hold on, there’s one for the men too. ‘Fuel for Life’ Homme Spray ($44.50/1.7oz) is definitely masculine. It is top notes of anise and grapefruit, middle notes of raspberry and lavender and base notes of heliotrope and dry woods. This one is encased in a tough guy canvas-type cloth that reminds me of a canteen. Both available in Shower Gel, After Shave (men) and Body Lotion @ macys.com.